We offer an instrumental range of products made using high quality vibration meters. Our entire range is procured from the renowned vendors of the industry, who manufacture them in compliance with the industry standards. We source these products from the leading vendors after ensuring their quality. We are offering a wide range of Digital Vibration Meter VM6360 which is used for measuring periodic motion, to check the imbalance and deflecting of moving machinery. 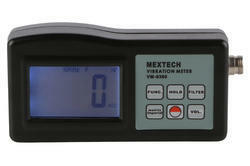 Is specifically designed for present measuring various mechanical vibrations. So as to provide the data for the quality control, run time and equipment upkeep. It is also used in the high-performance acceleration meter, realize the repetitiveness and accurate measurement. It has the function of testing axle bearing situation.